OUR PRICE: $15.75 - Join Rewards Get $1 Dance Dollars On This Item! 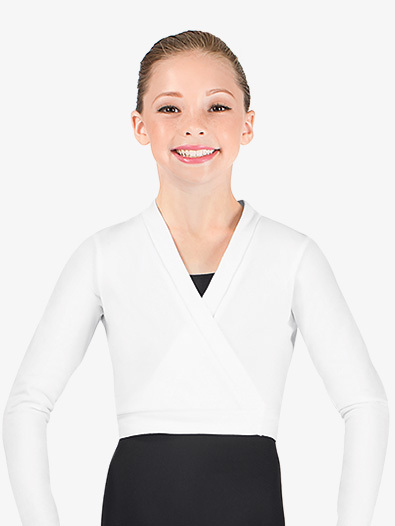 The perfect addition to your ballerina's dance class wardrobe! This basic wrap top features a self-tie. Looks great when layered over your favorite Theatricals leotard! I was a bit disappointed when the wrap was delivered. I tried it on and it was a very different material from what I was expecting. The images made it look like a knit wrap and the description said it was 95 cotton but when received it was more spandex like than I would have wished. On top of that it ran small. I am an average Large when it comes to things like this, when I received the package I tried it on to find that it was very tight on my arms and was almost cutting of my blood circulation. Overall I was not very happy with this and I really liked the idea but this was a bad option for a dance wrap. would NOT recommend. This is soft and stretchy, a great buy for the price!